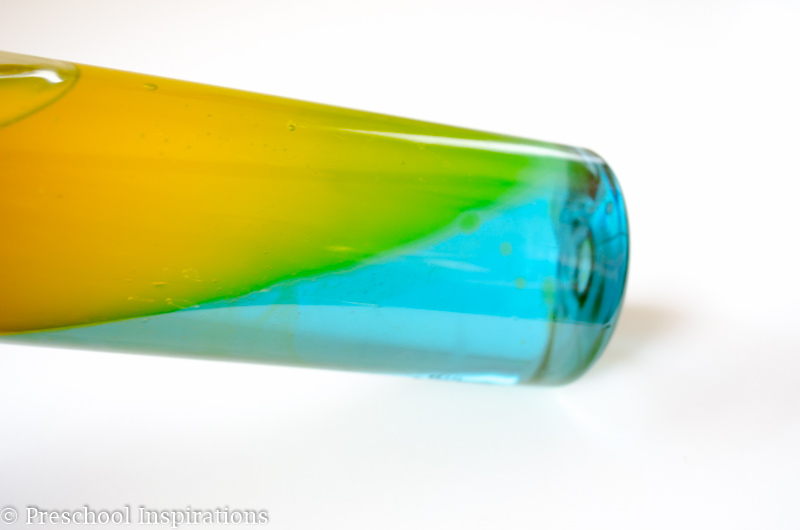 Ever since the first time I ever laid eyes on a color mixing sensory bottle, I was in love. But then I saw the price tag — eeeek! I decided to try and make my own at that point. 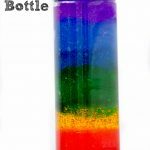 I love a good science challenge, and now I can’t wait to show you how to make a color mixing sensory bottle or discovery bottle of your own too. We absolutely love our color mixing bottles. Play with them. Put them in a window or at a light table. Or you can even just look at them. They are extra flowy, gliding through the bottle. I did not make these with water, so you don’t get the bubbly effect that water makes. Instead, it’s a heavy mixture with pockets and lines of color. We love the gorgeous color hues and gentle waves that it makes. What a perfect activity these would be for a ton of units in your preschool curriculum: color mixing theme, learning about colors, sensory play, for a heavy lifting tool, and as a sensory tool. These are perfect for all ages too! Turn yellow and blue to green. Then it goes back to blue and yellow. Combine pink and light blue to produce a pretty spectacular purple! And last but not least is orange. Put together red and yellow to make this beauty! Here are the materials I used. I’ll give some substitute recipes as well because you may not be able to find all of these if you live outside of the U.S. Liquid watercolors: magenta, blue, and red. Ours are from Discount School Supply , but you can find them on Amazon too. You may be able to substitute food coloring, although I did not try this. So it depends on if you are in the mood for a little experimenting. Liquid watercolors are easiest to find online, so just keep that in mind. Certain stores are starting to carry them. I’ve heard Michael’s and Lakeshore Learning, but I would certainly call before making a trip! You won’t need yellow liquid watercolor if you follow my recipe exactly. The Wilton candy dye set is to dye the mineral oil. While it is made for dyeing candy, it works like a charm for this as well. You must use oil dye — liquid watercolors or food coloring will not work since they are water based. When I originally looked for oil dye and found that it was so pricey, my friend, Asia, author of The Curious Kid’s Science Book: 100+ Creative Hands-On Activities for Ages 4-8 (one of our favorite books), said I could find Wilton oil dye at Michael’s. I even had a 40% off coupon! However, the Wilton dye set on Amazon is a decent price if there isn’t a craft store super close to you. I also found the Wilton set at JoAnn Fabrics. Call ahead though if it’s not a close trip. There are two sets of candy dyes, and the one I wanted was out of stock at some stores. You will find them in the cake decorating section or near the chocolate molds. I tried many stores before I found it in stock, so Amazon is definitely a good option. Mineral oil can be found at your local grocery store, pharmacy, and even some dollar stores. Corn syrup is a U.S. item and in the baking aisle or near other syrups at the grocery store. It is about the consistency of honey if you live internationally. Alternatively, you could use this recipe from Play Trains, which does not call for corn syrup. The first bottle I made was a piece of cake! It turned out perfectly the first time. That was the blue and yellow bottle. It might be the best one to start with. Then I had to use some trial and error for the others. These are definitely not the easiest bottles to make, so if you would like a recipe that is less steps and ingredients, I recommend using this recipe from Play Trains instead. You could also try this in a really small quantity with baby food jars. That’s how I experimented with the colors, and those are what eventually helped me perfect the process. If you are on the fence about whether this process is something you want to jump into, using baby food jars would give you a good feel as to whether you want to fully commit. I’ll have to add a photo of those because they are super cute themselves! You will need to put your colored corn syrup as the first ingredient into the sensory bottle. The exact amount depends on the size of your bottle or jar. This will be half of your bottle (minus the extra space you are leaving for the mixture to flow), but you will need more corn syrup than that since corn syrup is really thick and doesn’t transfer super well. 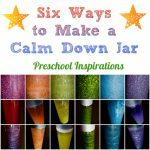 And add a little bit extra on top of that because you may want to test your colors in a small quantity before putting them into your sensory bottle. Don’t forget that baby food jars are perfect testers too! As a general rule, if you need 5 oz of corn syrup, you should make sure to have at least 7-8 ounces. When I buy for these types of discovery bottles, I usually get 2 containers of corn syrup even if I think I’ll only need one. I would rather have extra on hand than have to run out and get more. I highly recommend doing this in a clear container that is about the width of the sensory bottle you are using. You want to see how bright your colors are! Do it during the day with natural light too for best results. I don’t recommend trying to mix this in your sensory bottle. And I am saying this from experience, ha. The trickiest part about the entire process is the color mixing itself! Begin by putting in about half the corn syrup and adding a few drops of liquid watercolor . That is why I say start with less. I add 3-5 drops of liquid watercolor to the corn syrup then stir it altogether. Then I add more corn syrup As you can see in my photos, the colors are pretty light. I used this food coloring chart as my guide for the blue and yellow bottle and red and yellow bottle. I also looked at these color mixing discovery bottles, which were my initial inspiration for this project. You will just have to keep a close eye on it and keep comparing it with the photos of the finished product. For the blue and yellow bottle, color the corn syrup light blue with liquid watercolors. 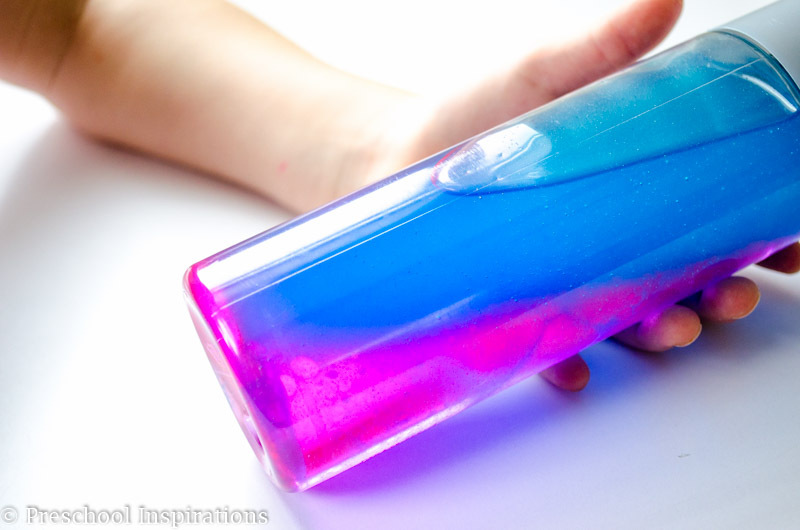 For the pink and blue bottle, color the corn syrup light magenta to make the light pink with liquid watercolors. 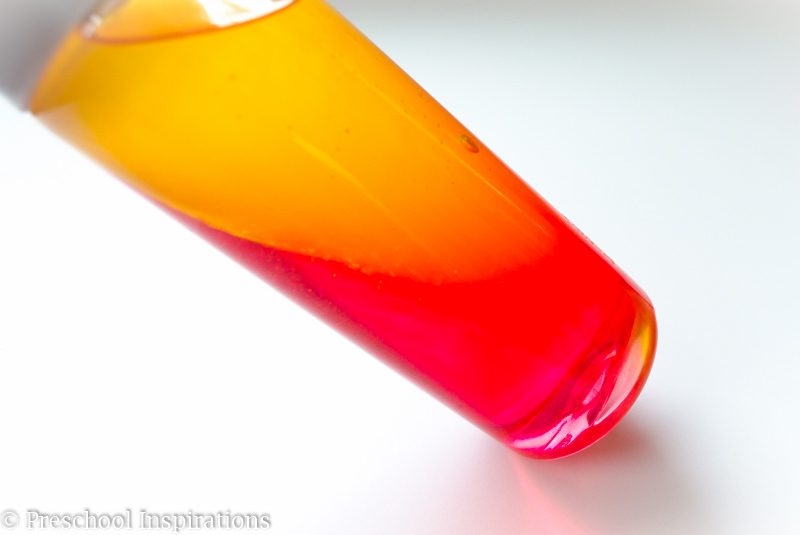 For the yellow and red bottle, color the corn syrup light red with liquid watercolors. Once you are all ready to put the colored corn syrup into your sensory bottle, grab a funnel (if you’re not using a container with a pouring spout), and pour it about half way in. Use a spatula to help get the corn syrup out of your mixing container. If only I had thought of that while making mine! Note: I keep the area where the silver lid is empty to make room for the liquid to flow easier. 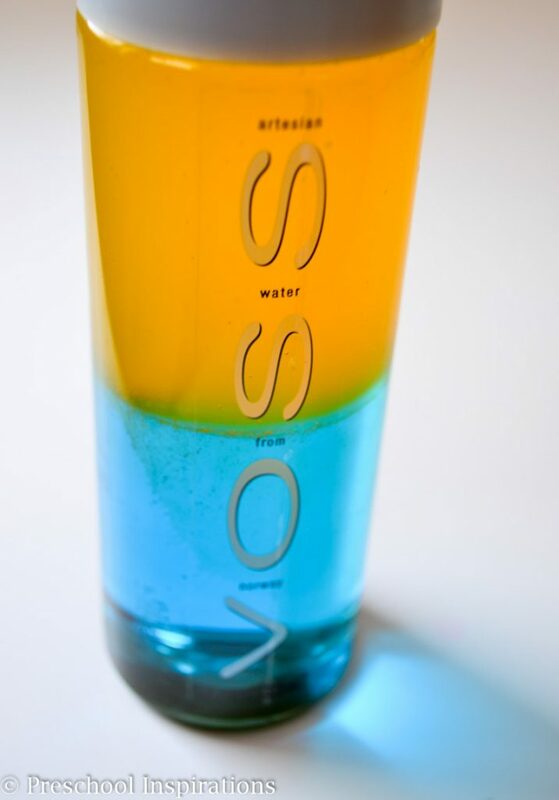 If you are using a VOSS bottle, half way up would be between the ‘O’ and the ‘S’. You can see it here in my photo. Now comes for the messy part. I have blue stained hands as I am typing this out in fact! You are going to dye the mineral oil. Be sure not to use liquid watercolor or food coloring. Just put those away out of sight to prevent any accidents even! And I don’t let children help with this part, not even my own. Some people are more brave than I am though. For quantity, make sure you have just a little bit more than half of the bottle. 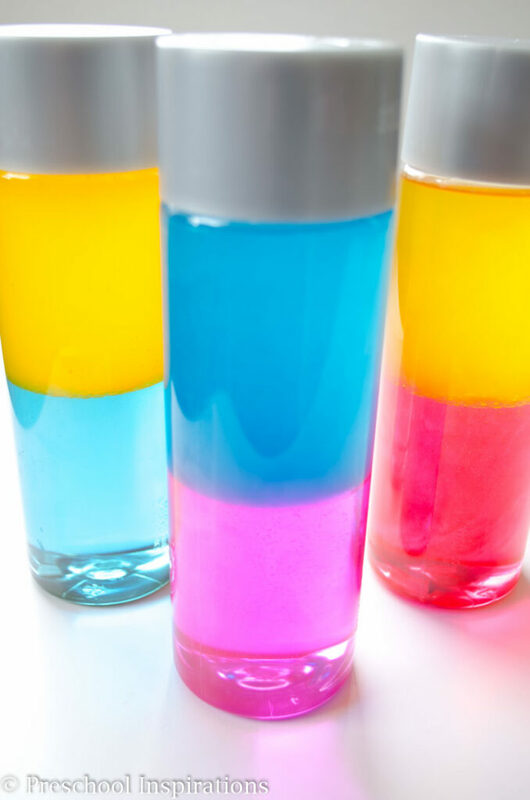 Mineral oil is so much easier to transfer than corn syrup, but you may want to test it in baby food jars to make sure you have a color that you are satisfied with. You need oil dye to color the oil (and any other type of oil). Grab your Wilton candy dyes, and a container to mix them in. I highly recommend doing this in a clear container that is about the width of the sensory bottle you are using. You want to see how bright your colors are! Do it during the day with natural light too for best results. I don’t recommend trying to mix this in your sensory bottle. That would be a disaster actually. The Wilton coloring is SUPER strong. I found the best way to do this was to dab the tip of a straw into the coloring and mix it into the mineral oil. You’ll have to mix it quite a bit. Again, start off with less mineral oil than you really need. That way if you get a color that is much too bright, you might be able to salvage it by adding more mineral oil. Worst case scenario though is that you can always start over or use your sensory bottles with a light table or at a window. For the blue and yellow bottle, dye the oil yellow with your candy dye. 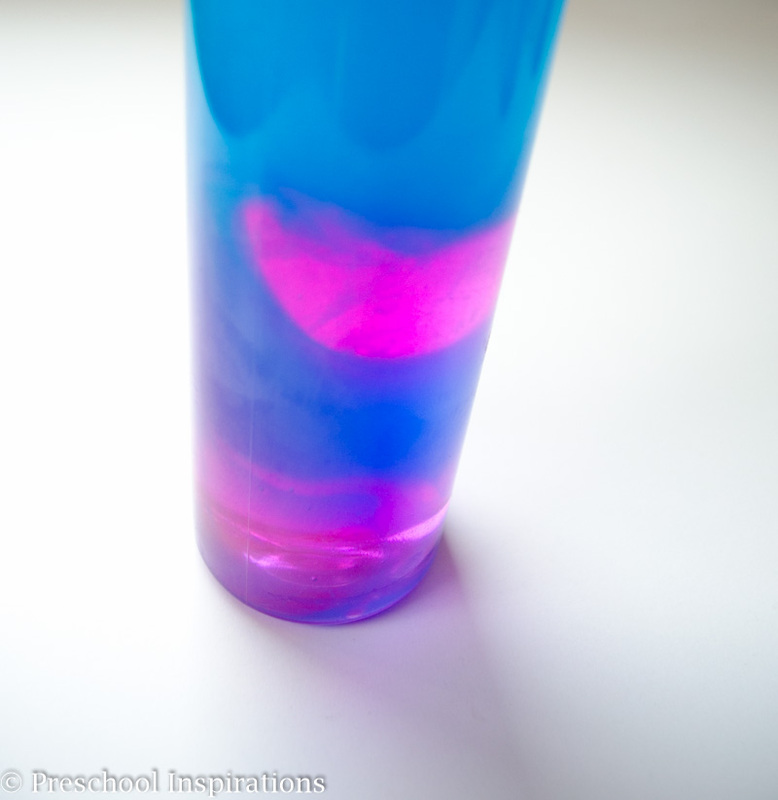 For the pink and blue bottle, dye the oil with the blue candy dye. For the red and yellow bottle, dye the oil with the yellow candy dye. If you plan on making all three bottles, you can actually just make double of the yellow oil, which quickens and simplifies the process. Once you are ready to add your oil, use a funnel or container with a pouring spout and fill your bottle up the rest of the way. Make sure to include a little empty space. It doesn’t have to be very much with these bottles though. To finish off your bottle, glue the lid with gorilla glue or hot glue! You do not want oil dye all over your floors or any other surface! And keep checking the lid every few weeks because the glue does weaken over time. And there you have it! 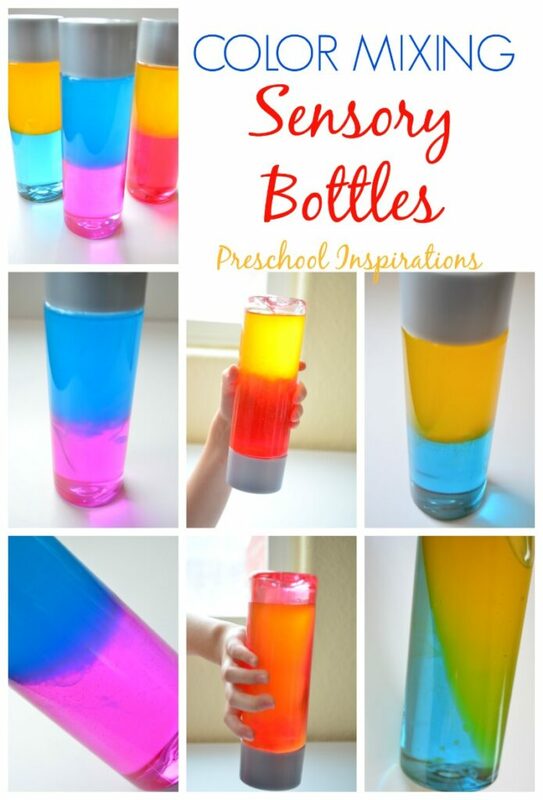 Now you know how to make a color mixing sensory bottle! These look really neat! I wonder if you could just use a few drops of oil paint, or would that have a whole lot of other stuff mixed in with it? I also considered doing oil-based paint! I’ll have to experiment with that soon (if I can find where I stored my extra paint, ha). I bet that someone who worked at a paint store might have some good insights on that though :). Great idea, Joy! I have just tried this with oil paint….it didn’t work! Oh bummer! But good to know! Thank you for telling us!! I plan to try this in March. I was able to find liquid water color at a teacher supply store. I also found liquid water colors with glitter. Both were very affordable. Yay, I hope you love it! Wow, you are the first person I’ve ever heard say that you have found liquid watercolor at a store. They are a smart store :)! Hopefully it will catch on and more will do the same. There are none near me sadly :(. We have a local Lakeshore. We do have art stores I have not tried those places. Hi..Did you find it in a Lakeshore store?? If not, was it a store that I could order from online? I have used crayons to color the mineral oil… I put it in the microwave for a few seconds at a time until the crayon melted into the oil. The bottles lasted for several years but I used very thin-walled water bottles and the plastic started breaking down after about 4 or 5 years of use in the classroom. Rondee, that is a BRILLIANT idea! I can’t wait to try that now! Thank you so much for sharing that wonderful tip :). I was able to find liquid water colors at Michaels. Hopefully I got the right stuff!! They only carried one brand but they had a full set of colors in the adult paint area (where they break all the paint sections down by experience level if that helps). Haven’t tried this yet but I can’t wait. I’ve been all over trying to find mineral oil of all things so once I got my voss bottles I hope to get started! Curious why the mineral oil part is real messy – what caused your hands to get dyed? Was it during the transfer to the bottle or the mixing part? Thanks!! Yayyy! I love that your Michaels carries liquid watercolors! I have to double check on mine. It’s messy because the oil dye is a sticky consistency. I got it all over during the mixing part. If you have paper towels down and a trash can handy, that definitely helps! I hope it turns out awesome for you!! Hi Gayle! Do you have lamp oil? You would just have to be vigilant with it because it’s not as safe. Cooking oil works too. And Wilton dye is just chocolate and candy dye. I imagine there is an alternative with a different name. Please let us know if you find one. Someone who bakes a lot or does fancy cakes may be able to suggest something. It just has to be oil based. Otherwise, you could try melting crayons into oil as someone else suggested. As far as the corn syrup, you can substitute water. It does not keep the color though. Honey might be worth trying or even liquid hand soap. It’s all a big science experiment though. I unfortunately don’t have any definite answers. All of my recipes come after lots of trial and error. Do keep us posted if you find a great alternative! Most baby oils are mineral oil based with fragrance. I just bought a less expensive generic brand. Thanks, Corey! They are pretty rad to watch! Will the Wilton Royal Icing dye work as well as the Wilton Candy Dye? And will baby oil work as well as mineral oil? Hi Deborah. I would not recommend the Royal Icing dye unless you are sure it does not have any water…and I’m pretty sure it does. The candy dye is the only oil based one that I am aware of. But the baby oil will definitely work :). Hi! These look awesome but I was wondering if it was important which colors were mixed with each substance? I have yellow liquid watercolor on hand, do you think it’d work if the corn syrup was yellow and the mineral oil was blue or red? I think it turned out best with the darker color on the bottom. But I am pickier than most ;). I’d say try it with a baby food jar and if you like the results, than make a bigger one that way :). Have fun! Hi Katie, I made these pretty much exactly as described–corn syrup, mineral oil, WIlton’s dye and liquid food coloring in the corn syrup. Looked SO GOOD at first, but now the Dye from the upper color (oil/Wiltons) is seeping into my lower color. I can literally see it seeping down in there and turning my blues purple, green, etc while the upper color gets paler! Started happening after about a month and continues to get worse. Has this happened to anyone else?? Any clue where I went wrong? Hi Marr, A couple of mine did change a bit after several months, but nothing huge. I think it’s a great way for children to see the color changes first hand! Any sensory bottle is a bit of a science experiment, and even when I make my bottles with the same directions, they always turn out a tad different. My first one did this almost immediately. Wondering if I didn’t mix the candy dye & mineral oil thoroughly enough. I just figured the oil based dye wouldn’t be physically able to mix into the water based (corn syrup) layer. Oops. All of mine did this within about 15 minutes. Whyyyyyy? Did anyone figure out what causes it? My bottom colors are purple, green, and orange now. I’m wondering about the corn syrup. I’m not sure what your corn syrup is like but the corn syrup in Canada is extremely thick. Not very pour-able. Is that what it is suppose to be like for this project? I am having a hard time seeing how the corn syrup and the oil would mix at all. Hi LuCynda, I plan on making a video for this to help folks understand better. I’ll put the video up around May to help better understand the process! Does it Need to be a glass bottle?? Nope, not at all! I use plastic :). Only if it is oil-based. I hope this helps! Couldn’t you put a cork or a rubber cork in the bottle and then add the cap? That’s a good idea. I haven’t tried that, but if you do, I’d love to hear how it goes! In both the oil and corn syrup and the water and glue sensory bottles, is it ok to add sequins or tiny glitter stars and shapes? I know that fine glitter is best but I like the glitter stars and hearts. Would they work in the oil one?